Hunting down good ramen places was a must when we visited Japan. 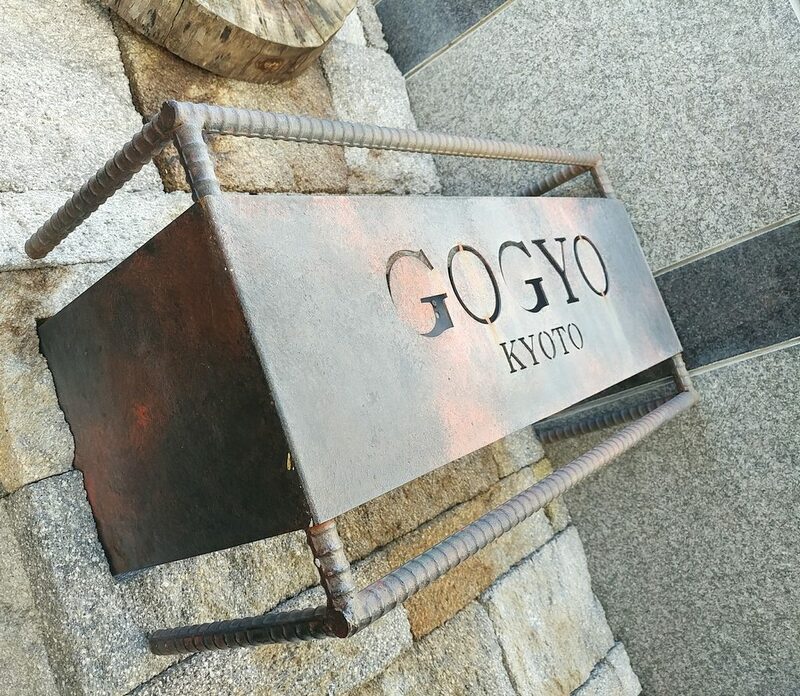 In Kyoto, Kyoto Gogyo Ramen received many mentions, so was a necessary stop. 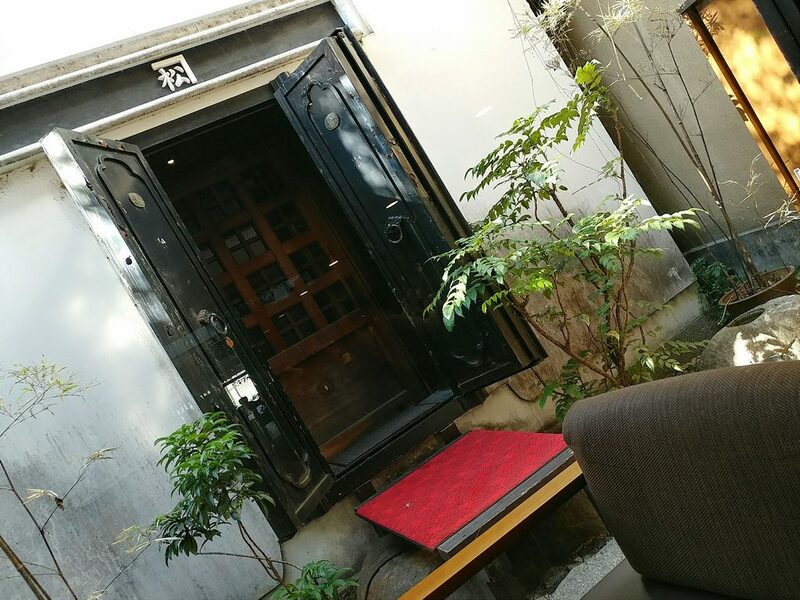 Conveniently for travellers, it is located not too far off the beaten track, just off the popular Nishiki Market. You can even stop for Kinotoya Bake Cheese Tarts on the way there or back, if there is still room. 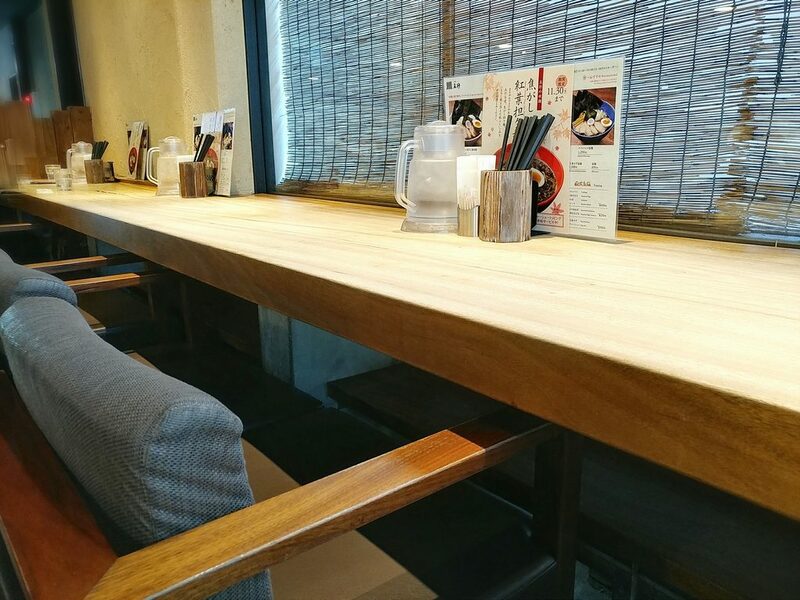 From the outside, it looks like a standard little ramen bar, a row of seats along the counter that you can just see through the glass. When you walk in, however, you discover that there is a whole area beyond that, past a glass enclosure with greenery and a stone shrine. It is certainly far from a hole-in-the-wall joint. 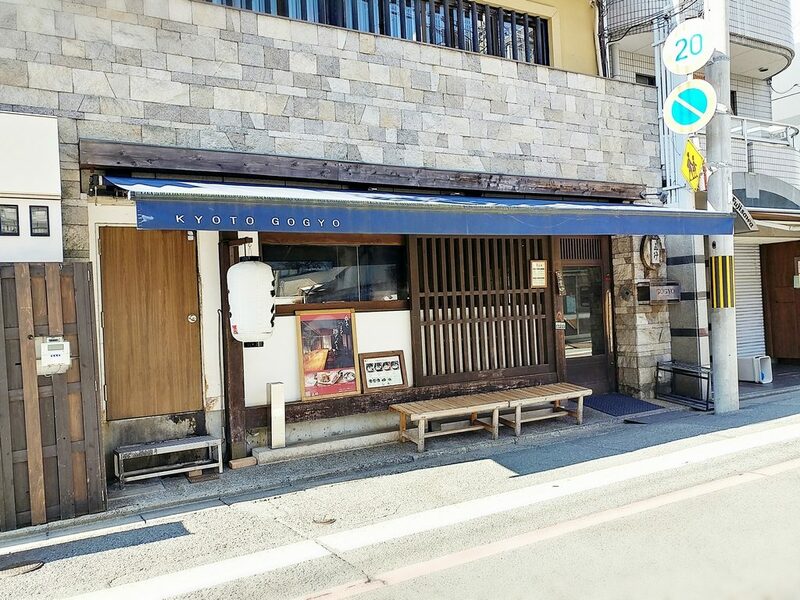 The outside of Kyoto Gogyo Ramen. If you get there at the right time, you’ll avoid the lineup. A courtyard space separating the kitchen counter dining from another seating section. The interior is a modern interpretation of classic Japanese design. It has long, clean lines, with earth tones everywhere. The pale wood tabletops are about 8cm thick, giving them a weighty feel. You have the option of a counter-style seat along one side of the room, with glass looking out to another courtyard, or more typical tables fitting either two or four. 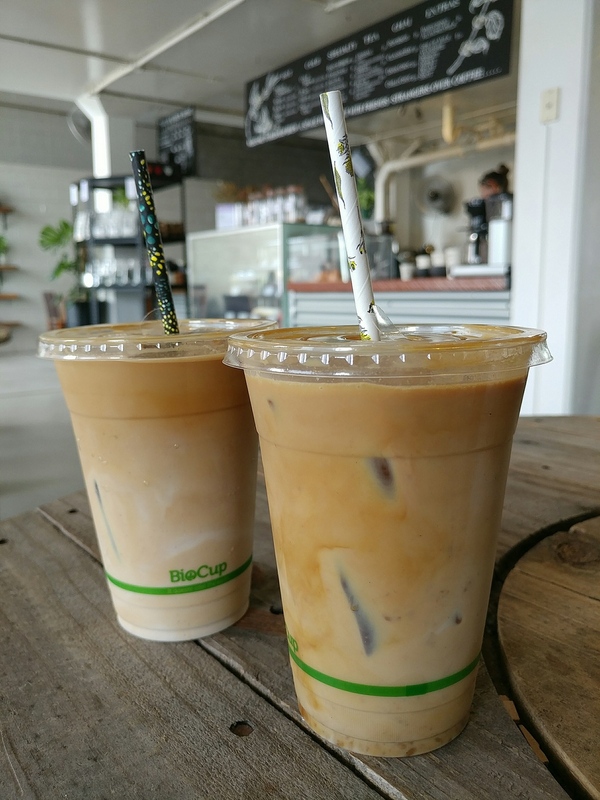 The chairs themselves are square and roomy, comfortably cushioned, with those at the counter in matching one-armed pairs. 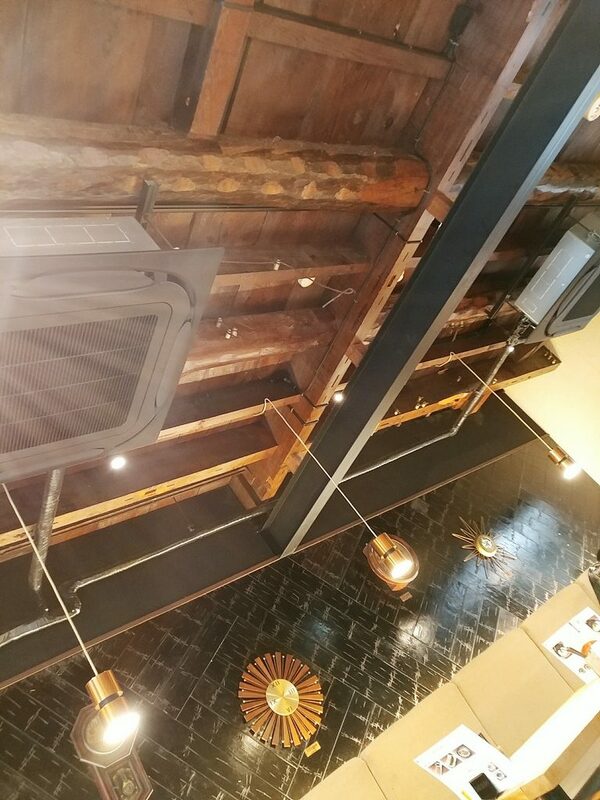 The dark wood ceiling is offset by warm downlights. It is elegant, but at the same time cosy. Modern pop music was playing, not too loudly. It felt a little odd hearing the likes of Pink and Ed Sheeran playing in this space, half a world away from where you might expect to hear it. Later on, it turned to hip hop music with plenty of swearing, even more jarring and less suited to the dining space. The larger seating area, simply but elegantly set up. The wooden ceiling, and art deco clocks on the wall displaying the time in different cities around the world. 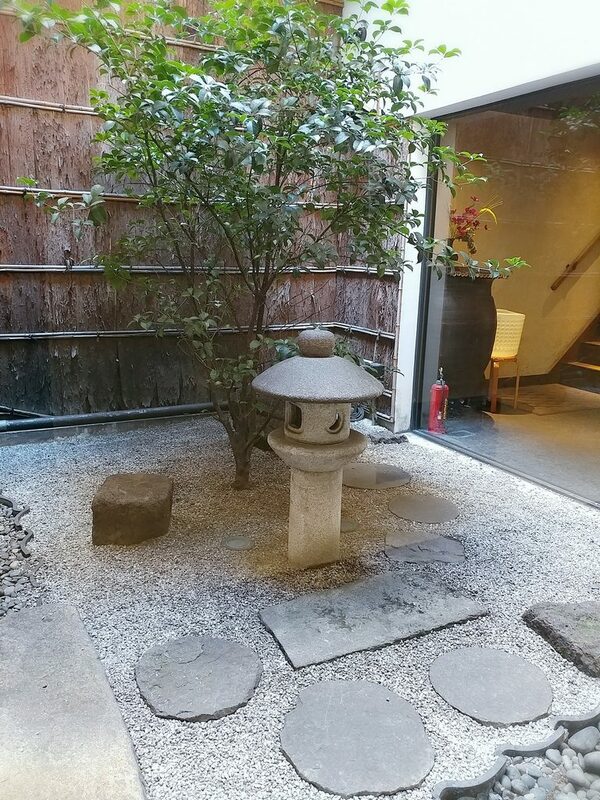 The little courtyard on the other side. 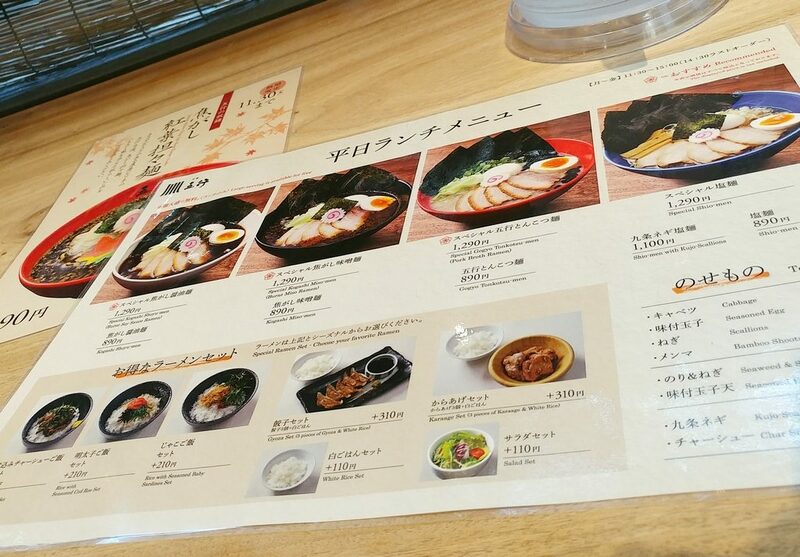 On the tables, besides the jug of iced water and containers of utensils and serviettes that you would typically find at a ramen shop, were laminated menus showing the four types of ramen they do. 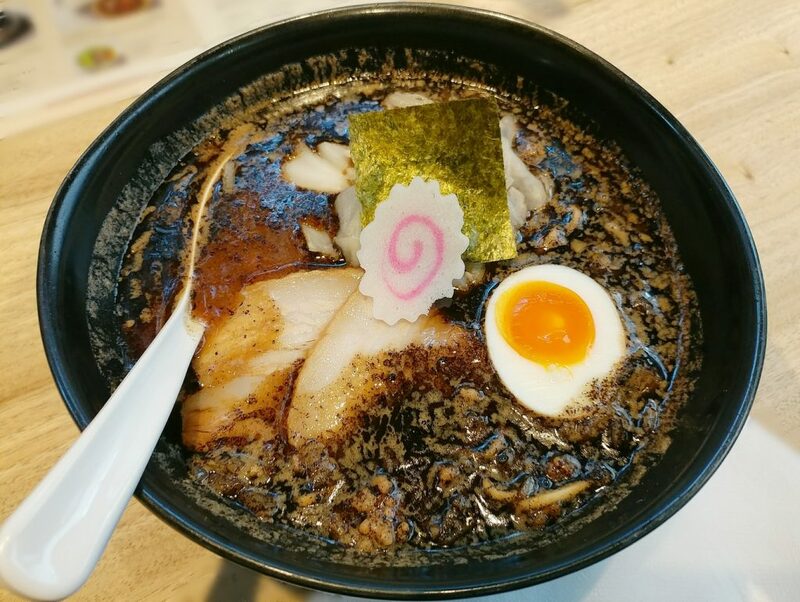 They offer a tonkotsu ramen, a shio ramen, a burnt shoyu ramen, and a burnt miso ramen. You can have just the ramen bowls, or construct sets with additional accompaniments. There are also rice and other side dishes on the other side of the sheet. The setup at the table. 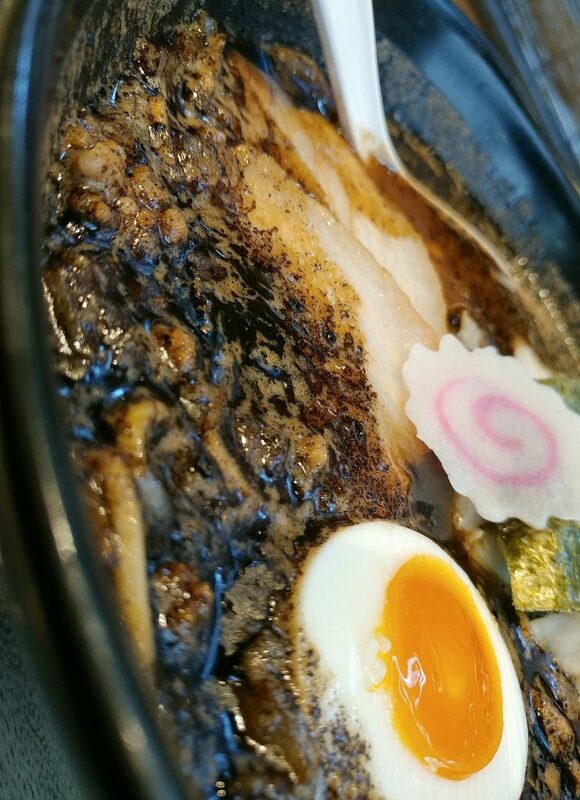 Having read the rave reviews, we had to have the burnt miso ramen. 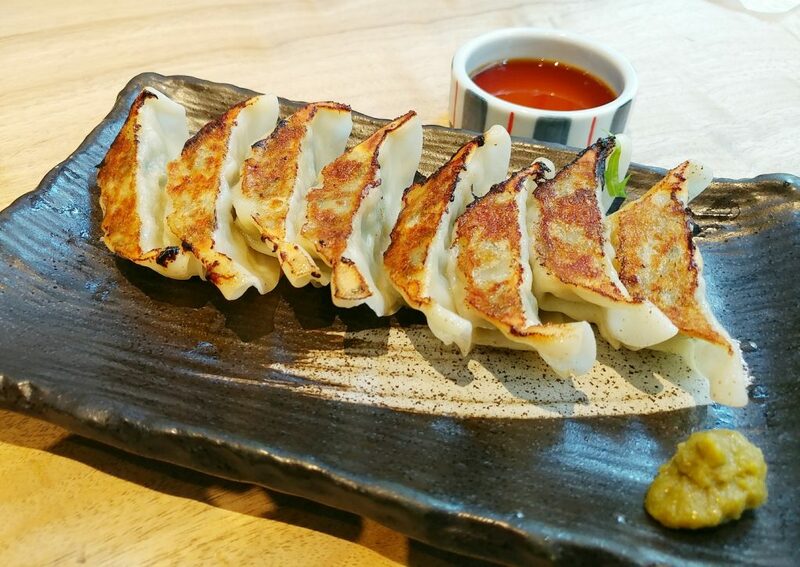 We also couldn’t resist getting gyoza to go with it. The menu, if you wanted to see other options. The burnt miso ramen was brought out in almost conical bowls. 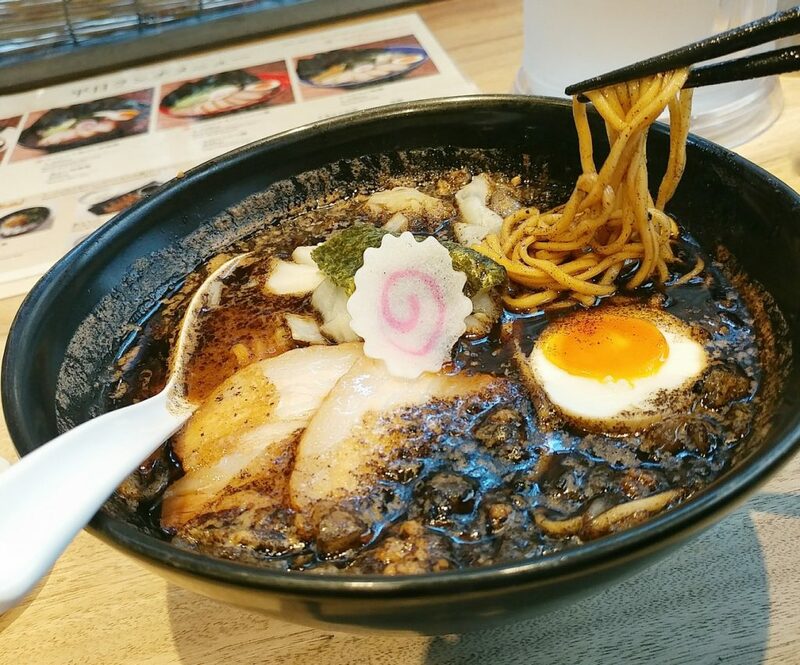 It looked different from any other ramen we had seen, including the ones with black garlic oil, usually a splash across the top. There was a shadow-black layer over everything, with some ingredients just breaking the surface. The bright white and orange yolk of the half egg stood out in stark contrast. Smoky, roasted aromas rose from the bowls, tantalising the palate in advance of the actual eating. The broth was rich, salty and umami, with slight sweetness in the background. There was nothing acrid or bitter in the flavour notes, despite the potentially alarming darkness of the roast. The ramen noodles were springy rather than doughy, with a pleasant chew. The pork slices were just a couple of milimetres thick, but tender and melt-in-the-mouth. The half egg, besides contributing to the appearance of the dish, was also perfectly cooked, with a gel-like gooey yolk. Instead of the more commonly used bamboo shoots, they had cabbage slices for crunch. 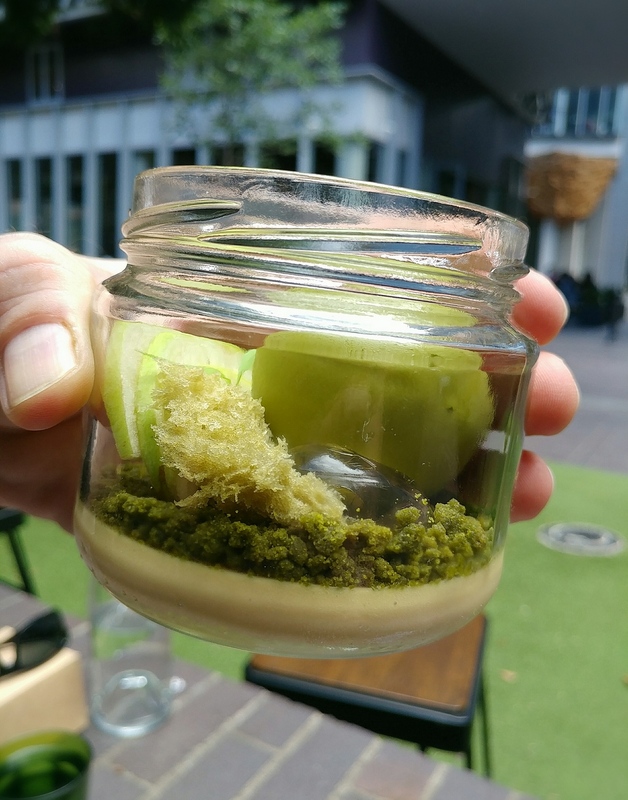 This delivered a similar texture, but with a cleaner flavour. It was certainly one of the tastiest ramens we have eaten. 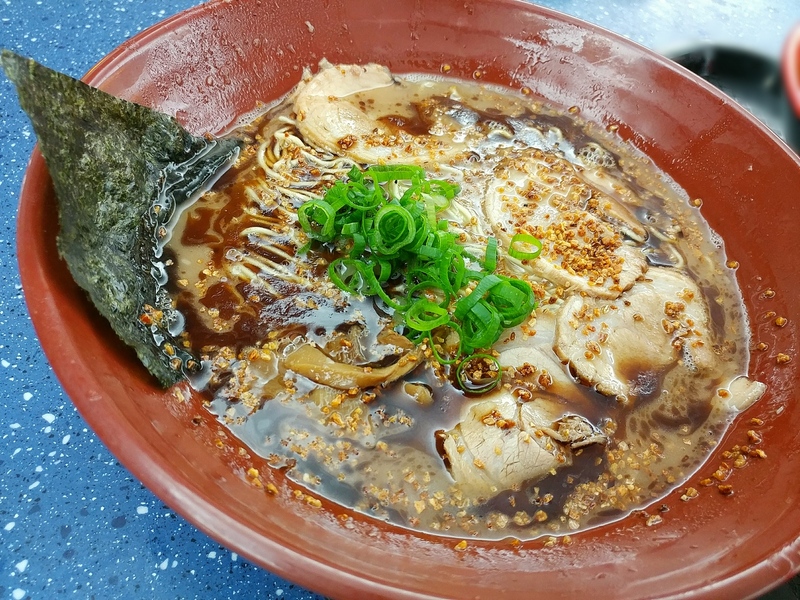 The Kyoto Gogyo burnt miso ramen, as served. The ramen from a slightly different angle..
Getting some of the ramen noodles out so you can actually see them. A closer look still at that broth and glossy egg yolk. 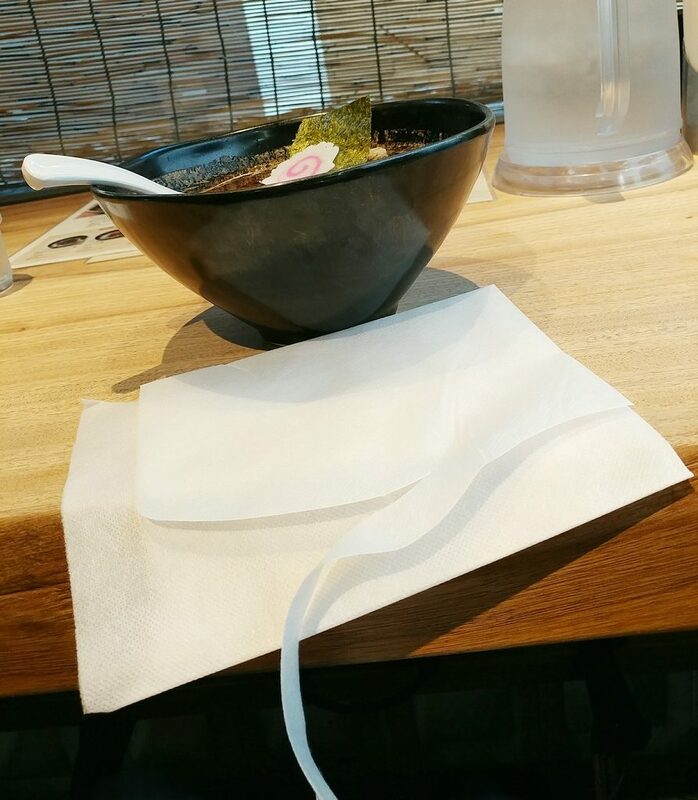 It is worth noting that we were brought paper aprons as the bowls of ramen were served. They had kindly taken into consideration the consequences of splatters of black oil on customers’ clothes, and pre-emptively provided protection. The apron, ready to be donned, and a better idea of the shape of the ramen bowl. The gyoza were brought out, still piping hot (of course), lined up on a beautiful brush-painted dish, accompanied by a bowl of dipping sauce. 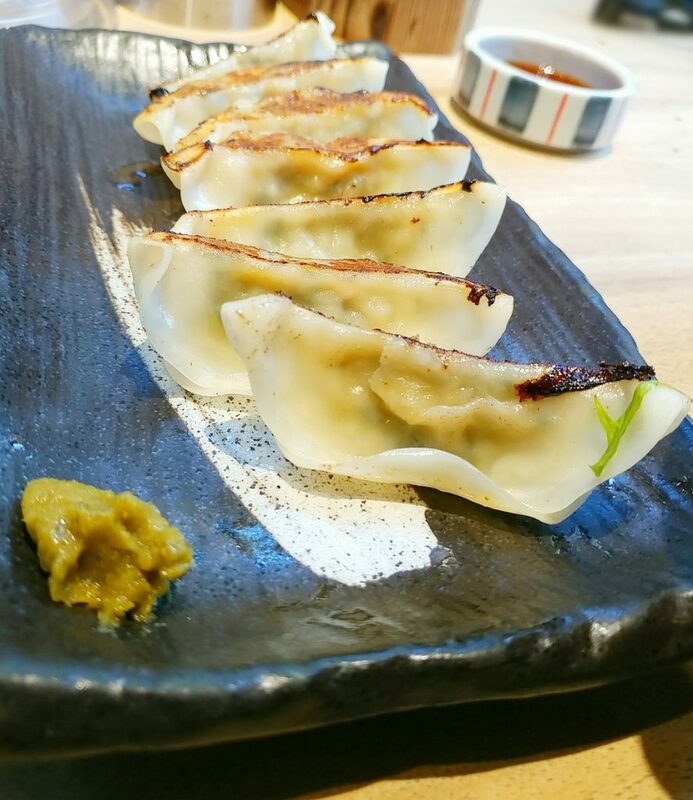 The gyoza had thin, almost translucent skins, with one side fried until golden brown and crispy. The meat filling was juicy and well-seasoned. 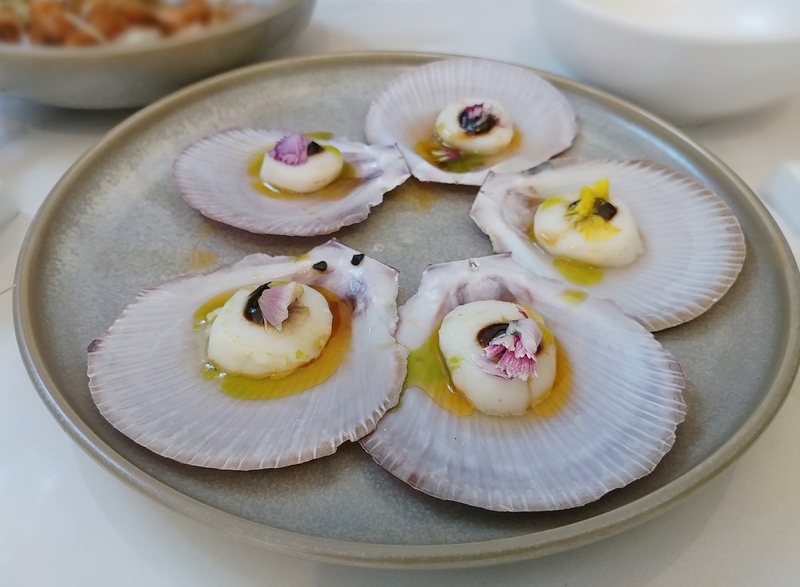 Besides the dipping sauce, there was also a chilli and yuzu paste to go with them, resembling a wasabi paste on the plate, but delivering different citrussy notes with the heat. 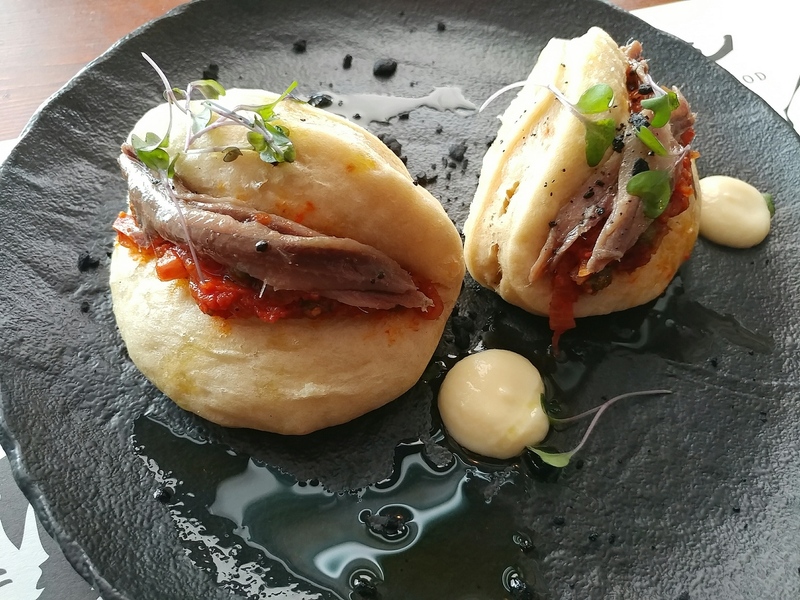 Again, we found these to be one of the better plates of gyoza around. The plate of gyoza, with additional flavourings. And the gyoza from their non-fried side. 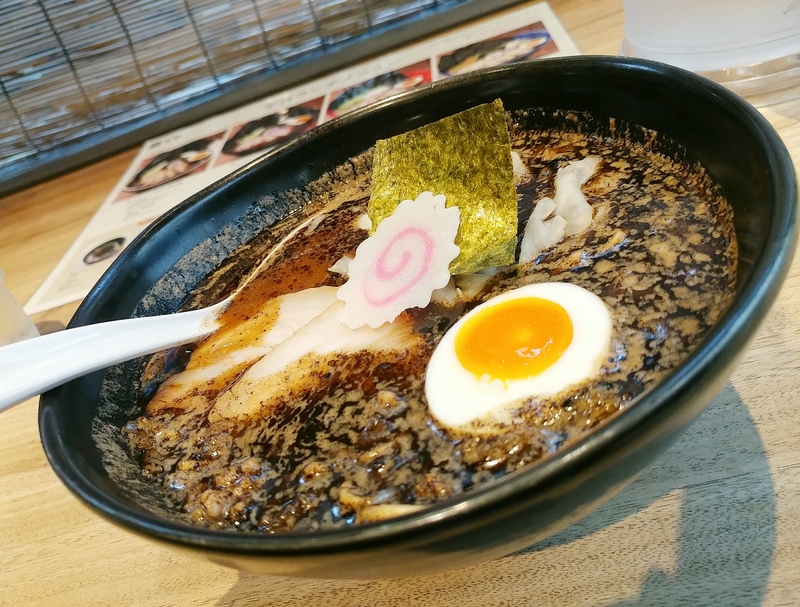 We would certainly recommend Kyoto Gogyo Ramen as a place to go if you are looking for pull-no-punches buckets of flavour food. Some people want delicately flavoured, subtle ramen broths. This isn’t the place for them. 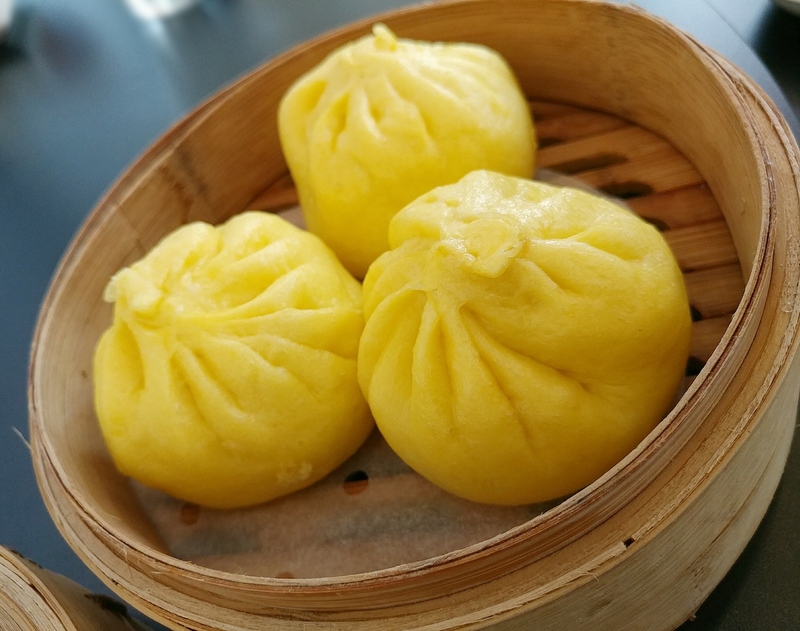 It has the stylings of a posh place, if you want a change from jostling shoulder-to-shoulder with famished salarymen at backstreet eateries. Price-wise, it is actually similar to what you would pay for a bowl of ramen at any other ramen shop, or it is at lunchtime anyway. 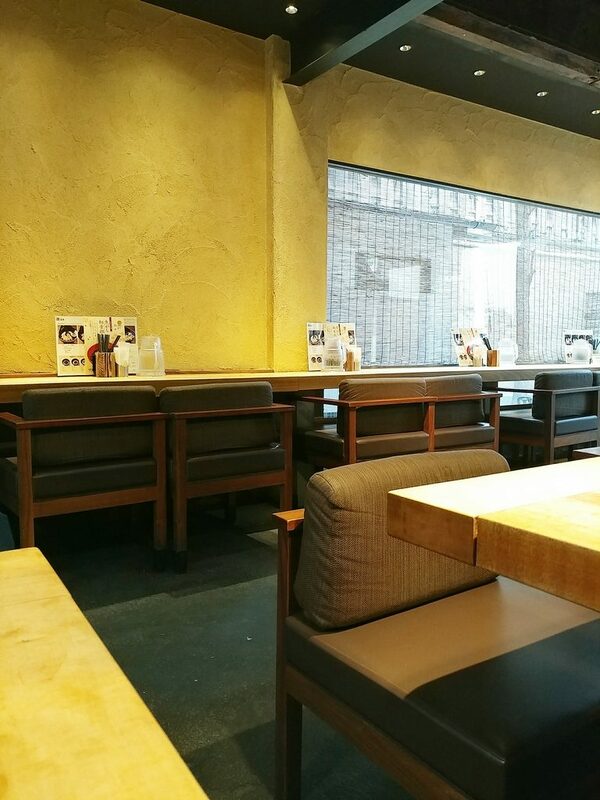 It seems that there is an extra charge at dinner, as well as more of a queue, so, word of wisdom, go there for lunch. You will leave sated. 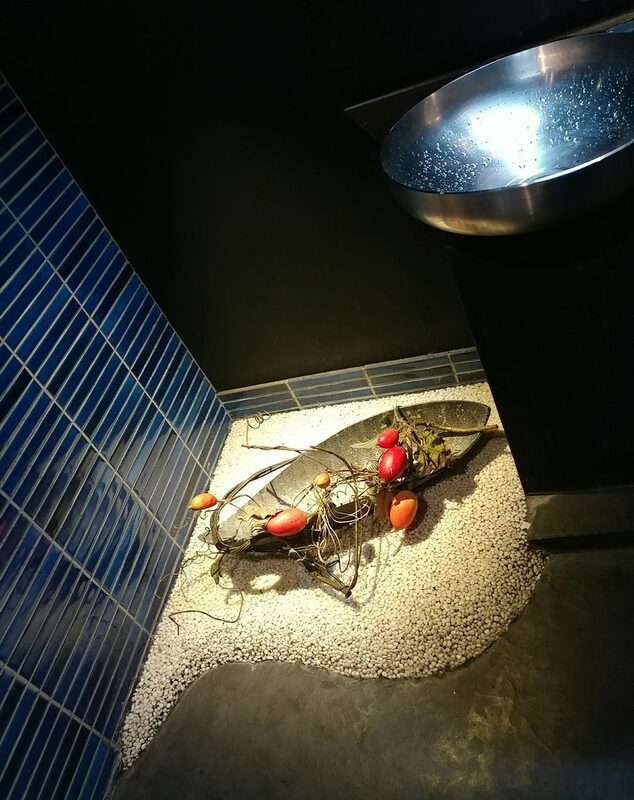 They even took the trouble to decorate the corner of the bathroom..
Price point: ¥850 for a bowl of ramen, ¥1250 to have it with a larger serve of ingredients. Side dishes like the gyoza or karage chicken for ¥490 to ¥590.